A couple of months ago we talked about a short film that Dom made in partnership with elusive Bristol street artist Stewy. That film was shown at the People’s Museum in Manchester as part of a day in which he re-created one of his works–a stencil portrait of feminist icon Mary Wollstonecroft. Dom and Stewy’s film was accepted for screening at the Portobello Film Festival, taking place in early September. It was shown in the iconic Pop-Up Cinema underneath the Westway, and presented an opportunity for an art happening that Stewy couldn’t resist. Stewy’s work is largely based on the notion of site-specific portraiture–that is, celebrating famous people in the areas where they lived and worked. The Westway and Ladbroke Grove is rich in pop culture history, and Stewy chose his subject carefully. 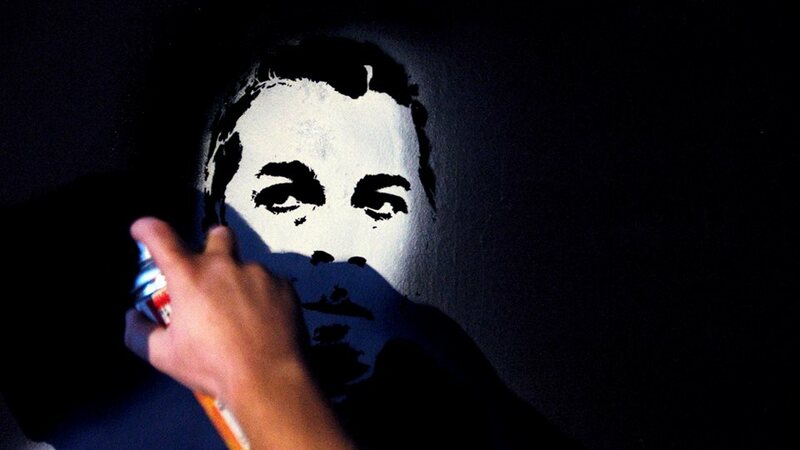 The Pop-Up has hosted graf work by renowned artists like Blek Le Rat, so Stewy was in good company when he and Dom rocked up at the Pop-up, spray-cans and stencils in hand. Under cover of darkness, Stewy got to work. The work went quickly (the joy of stencil graf is that all of the prep is done off-site, so you can throw up a piece incredibly quickly) and within ten minutes the Pop-Up had a new resident. 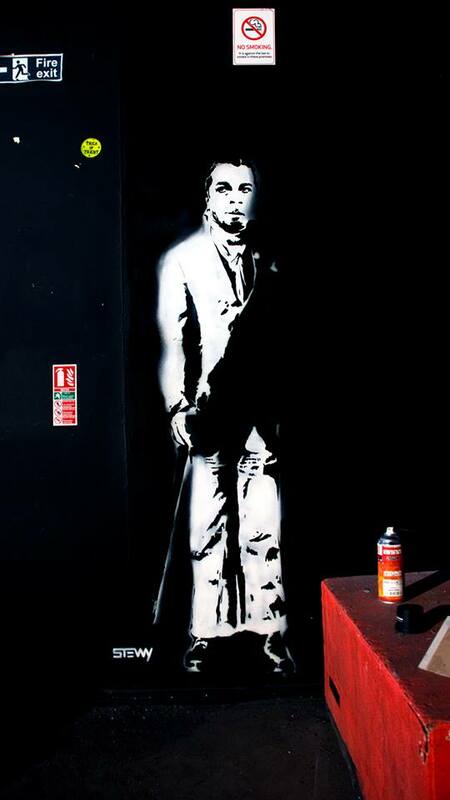 None other than the mighty Ian Dury. The documentary was well-received by the usual crowd of West London scenesters. Dom and Stewy made their way back to Bristol with the warm feeling that they’d definitely made an impression. As a sign of appreciation for Dom’s hard work on the documentary, Stewy presented him with an original work. 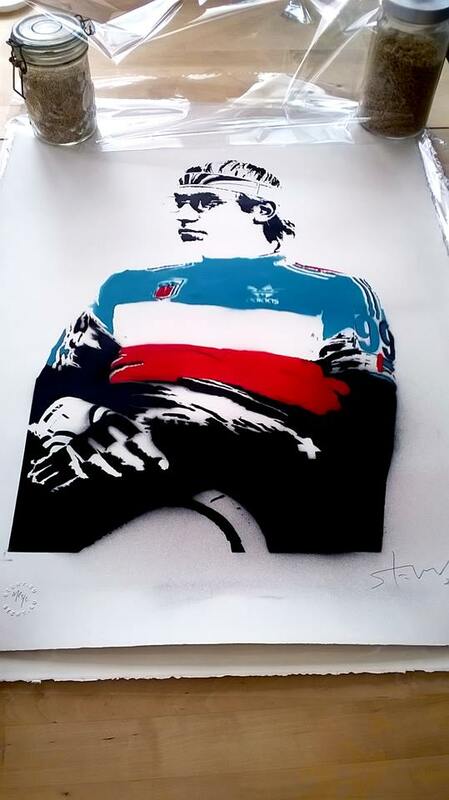 This is Laurent Fignon, French cycling legend and one of Dom’s heroes. Lovely gesture, don’t you think? We’ve heard that Stewy, Woolstonecraft And Graffiti has been nominated for a Documentary Award at the 2015 Portobello Film Festival. This is obviously great news and serves as vindication for the hard work that both Dom and Stewy put into the film. Well done, chaps! In celebration… let’s ‘ave a little dance, eh?